The Greater Union Pitt Centre in better days. Image by Ken Roe/cinematreasures.org. In 1999, I ventured into town to see Star Wars Episode I. My elaborate plan was to see it at the Pitt Centre cinema, which I’d always noticed tucked away behind the flashier George Street cinema strip. However, when I got into the city I found the cinema complex had been recently closed. My plan, my day had been ruined. Thanks, Greater Union Pitt Centre. 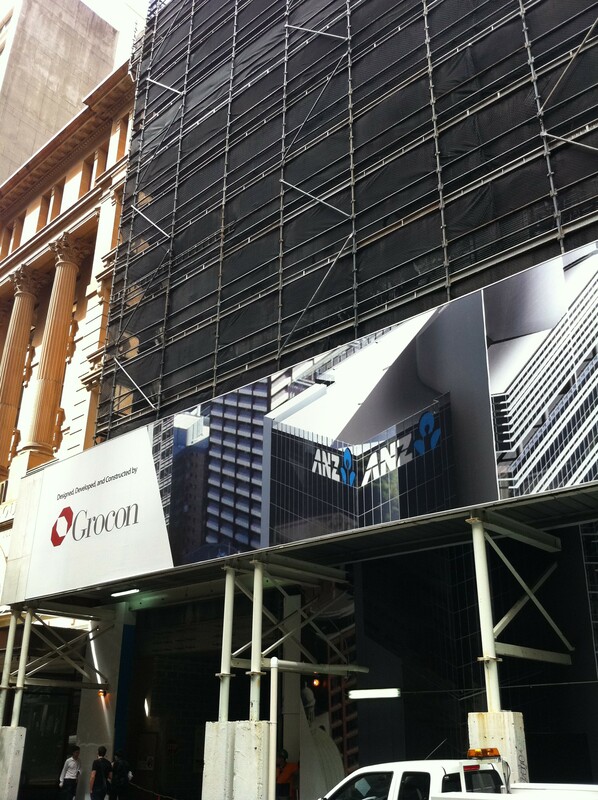 To the left sits the former Bank of NSW, a future entry on Past/Lives. You can’t buy that kind of advertising space. SHEEPISH UPDATE: it seems as though the above image is actually the rear of the Greater Union-owned State Theatre (see below). This revelation marks the second time the Pitt Centre has ruined my schemes. Thanks, Ellena! 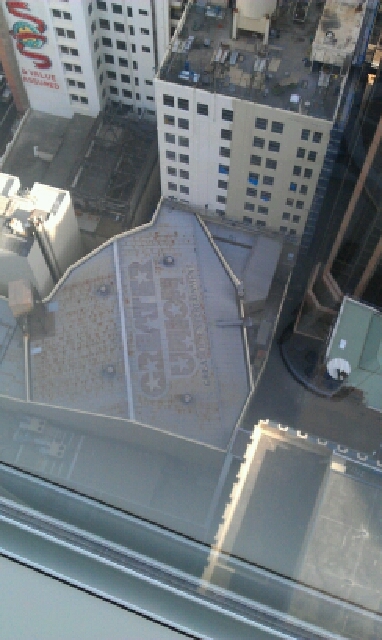 The lower picture appears to be the rear of Sydney’s State Theatre and the building above it, which housed Greater Union head office. 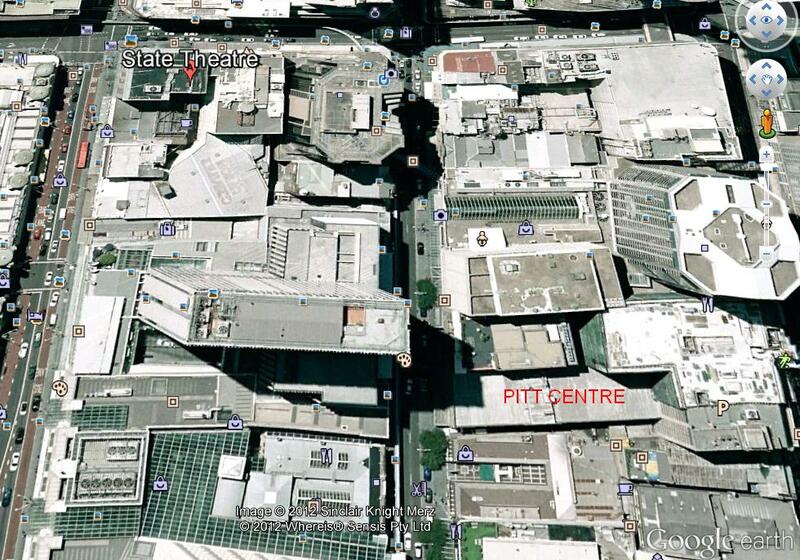 Not the Pitt Centre. I took a similar photo recently from the 25th floor of the Hilton Hotel – the old Pitt Centre was not far away, but couldn’t have made it into this shot. The third floor (used as functions/events space) of the Hilton hotel across the road on Pitt st afforded some interesting views of this poor cinema in its final death throes as it was being demolished. Sadly I didn’t get any pictures, but do remember making some regrettable cheap clothing and food purchases from the various stalls that occupied the site before its final demise. The first Brashs mega store was right near here too, possibly next door. Great nostalgia!